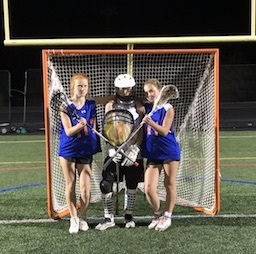 A trio of Peachtree City lacrosse athletes have been selected to compete in the All-American Nationals competition, representing their state later this month. The girls tried out in early 2018 and now join fellow athletes from across Georgia to face other states in their bracket. Calyn Scott, daughter of John and Kate Scott, will be an eighth-grader at J.C. Booth Middle School this fall, as will Riley Phillips, daughter of Brett and Kelly Phillips. Goalie Gabbie Szatkowski, daughter of Adam and Natalie Szatkowski, will be a freshman at McIntosh High School. All three girls have been playing for both Peachtree City Warriors and Atlanta Storm. Follow the program at www.nationallacrosseclassic.com.